Thanks for all the update VA! I'm so glad they were able to rescue him!!! I hope his knee heals quickly! Yeah. But it isn't a scrape; it's a hole. Wonder how he got that. Ann was directed by Dr. Sam to clip it, but it's hard because he doesn't like having it touched. Can't blame him for that. They had to turn the light off tonight because it was making him nervous, so she has to wait for daylight to finish clipping. Dr. Sam will be checking it himself in person instead of by photo, but he won't be able to get there until Sunday. I'm glad Spider is safe with them now. I know there's a product called Vetericyn that helps in fighting infections from cuts, scrapes and helps with skin conditions like rashes for animals. It replicates the body's natural chemicals used in fighting infections, etc. so even if the animal licks the product, it's not harmful to them. Saw this product while watching "Downunder Horsemanship" programs. You know, that stuff works! I actually bought a small bottle meaning to bring this to the stables as a sample to test out on the horses. But prior to that, I developed early signs of an infection in one of my pierced ears. The earlobe felt hot and swollen. I sprayed this Vetericyn on my earlobe where the pierced hole was and within an hour, the swelling and heat was gone! The human version is called Puracyn I believe. I'm sure Ann is up on the latest stuff, and Dr. Sam certainly is. He actually diagnosed Rowdy's problems just looking at pictures, but of course he checked this against the actual foal and had X-rays done, too to confirm his diagnosis. Ann did put something on Spider's knee that looked like a spray and then she wrapped it with a clean cloth. I guess that's to keep dirt out if he lies down. I hope they get him used to the light soon so we can check on him at night. You can see in the pictures they took of Spider when they visited him on Sunday that his right knee is bigger than the left. So I guess there is a swelling in the knee. I noticed it and wondered if that was the bad knee and today I saw that it was. Poor boy. I'm so glad I talked him up and got Ann interested in his connection to Mine That Bird because I think that helped. The donations sure picked up after she posted about that, after being stuck on $350 for a long time. By the way, Birdstone, their sire, was a very small horse too. Well, I guess he still is. He does produce winners, though. Vetericyn is not that new...it's been around for a few years already. Ann probably knows about this product although she probably gets the Veterinary (professional) version of the product under a different name. There are 2 types of Vetericyn sprays...one is just the regular (more liquidy) spray called Wound & Skin Care. The other is called "Hydro Gel" Wound & Skin Spray Care (more viscous) so it sticks to the area better. I guess the original watery version is great if you need to spray in the eyes, inside the ears or up the animals nostrils or inside the mouth. The hydro-gel is great if it's on a vertical surface of the skin as it doesn't drip away from the wound. The one I used for my ear lobe was the Hydro-Gel version. Found that Amazon.com using the super saver free shipping costs way less than at places like Petco, etc. LOL! I use the hydro-gel spray on any itchy/rash areas that pop up once in awhile even for myself although we're suppose to use products for humans instead...shhh! It's now 3:39 AM PST, 4:39 if one's body is is still on Daylight Time. Oops. 3:40. I'm going to bed. Good night. Thanks for the medical info. lol Now 3:41. I'm so tired it's hard to type without typos. Here's an update from Mea Ola's Place, from Ann: . ".I was busy with Sam (phone stuff) and catching up on emails. Then had to go get supplies for Spider. I am so proud of my wrap. A knee is not easy to wrap. I put a baby diaper on the front of his knee...it is taped above and below...then I cut a hole in a pillow wrap so it would not put pressure on his knee. The diaper bends and the pillow wrap is only wrapped above and below the knee so no pressure at the back of the knee when he lies down. It may take a couple of days to get it perfect, but I was so happy to have thought of the diaper:) I got the cords out to his stall and we will have lights tonight. He enjoyed chewing on last night's wrap...turkey!" Spider is lying down, sleeping right now. Smart horse as it's after 1 AM. Rowdy, however, is up in his stall. But he usually sprawls out on his side pretty soon. He's standing back behind the high wall. We're expecting very high winds for the next few days--red flag warnings. So he'll be happy to be in his semi-enclosed stall for the night. Thanks for the update VA! Spider update: this was his knee on Monday when he came, and then a pic from today. We are treating it daily and wrapping it. Dr Sam will be here this weekend and we are keeping him informed with our observations. He will need more diagnostics than originally thought. We will be xraying the knee to make sure this is not a joint infection, X-Ray his left rear fetlock, and ultra sound his pelvis. We suspect his pelvis was broken at some point and he may have infection in joints or bones in his body...we will be doing blood work as well. He is more painful about the left rear leg than he is this knee. Spider has been a perfect gentleman for treatments so far and extremely affectionate. We are All IN for Spider and he is probably going to need some miracles. He has a survivor heart and attitude, so I believe he can face this all head on. Will you believe with us? Stay tuned for updates please share his story, he is going to need all the help he can get! And don't forget to peek at him on camera. We love him very much already...sweet boy, Spider! I'm so glad he's in such good hands. Poor boy. Send good thoughts and prayers his way. And share with your networks. Here's another update from Mea Ola's place with video. The video shows me exactly where Spider is located. Behind the back wall in the stall, where you see Spider standing, is the back of the house and so Rowdy's paddock and stall is right there, too. The white fencing you see just to the left behind Spider's stall/corral is the end of Rowdy's paddock. Ann doesn't want to let Spider touch any other horses until they find out just what is going on with him, whether he has a bone infection, or whatever. "Sassy showing off for Spider" per Ann. I believe it was love at first sight here. Sassy is out showing off for Spider. I think the conversation went something like this..Sassy: "So, I hear you are some kind of racehorse, huh? Well, watch this!" Spider "Man, you are gorgeous, but get me fixed up and I will show you what a REAL Thoroughbred can do!" LOL...feel free to add your own caption or commentary. I saw Sassy running around on the live cam. Rowdy was watching too. She showed up on both their cams. Thanks for the update VA! I love hearing about this boy! I'm so glad he's in such capable and caring hands. Ann is worried that he may have a joint or bone infection which may even have caused the pelvis fracture. But considering that he's been fighting this only with his immune system, I think the prognosis is far from hopeless. Given a powerful antibiotic to help, I think he may recover quickly. And since the temperatures are no longer so brutally hot now, he won't need a stall in the house. hahaha. I had said I thought his wound looked like a burst abscess or hematoma. Both of those are things I've dealt with in dogs. She said I was right, that his knee joint infection had burst. Also he has a problem in one of his rear fetlocks which is causing him more discomfort than the knee. Poor guy. She also reported that his actual owner is happy they took Spider in, that he really loves Spider, and that the guy just got out of the hospital, so I'm sure Spider's current situation with Mea Ola is a great comfort to him. Things that are meant to be have a great way of coming together. I can just picture Ann and her hubby moving out to the stables and Spider and Rowdy taking over the air conditioned house. LOL! Yes, PG, I noted the tail action. hahaha Sassy is quite a flirt. She indeed has an appropriate name for sure. She was also flirting with Rowdy when he has much younger and Rowdy was intimidated by her and began to clack/yam his teeth. That hussy! LOL! I'm heading out now...gotta pick up my car from the mechanic shop. They are doing a last minute check to see if there's anything needed to fix under warranty before it expires next week. hahaha. Good luck with that. The car will start to fall apart in two weeks. Ha ha! VA_in_CA! That's what the mechanic is trying to do right now...To predict any possible warranty covered issues with my car so that even tho' it's not a problem yet, they will send in a claim before the deadline. This way, it will still be covered even if the warranty expired. Cross fingers! LOL! Ann says that she took Spider for a walk around the property yesterday and he was very much interested in several of the horses and seemed to have a special affinity for Sassy--of course, he knows beauty when he sees it--and also Babs, one of the feral mares rescued from the feed lot in Nevada last winter, and his favorite was Little Man, a pony. He was not at all drawn to Mea Ola--the chief mare and Sassy's disapproving mother (hahaha), or to Volt--a very flashy and studly (but gelded) chestnut. The two who were most interested in him were Grammos--the huge Oldenburg ex-jumper--and Romeo--Ann's own personal horse, a black and white Saddlebred. I think he will enjoy belonging to this herd. Ann generally turns them out into the big arena in groups of 2 or 3 at a time. Hopefully he will get his health issues resolved soon, so he can begin to hang with the others. Since he is still in quarantine, I suspect he didn't get to up close with Rowdy. Rowdy's not quite ready for such a big horse as Spider. Spider's 15.1 now and not yet 2. Paniolo_Gal suggested that you might want to see some pictures of the other Mea Ola rescues. Some are quite good-looking, even some of the older ones. So here are some of them. I'll start with Volt, Mea Ola, and Sassy and do some others another time. Volt is a 19 year old American Saddlebred, who shows evidence of having been a show horse. "He was found tied to someone’s fence with a hay string! Those people called animal control and off he went. He had feet about 4 inches too long–-horrible. He has some arthritis in his hocks, but it doesn’t seem to bother him much," says the Website. 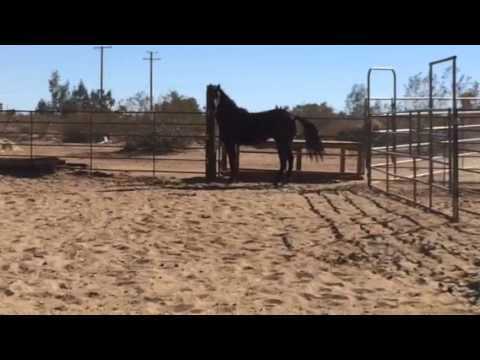 The Animal Control place had no facilities for housing a stallion so Ann rescued him, and had him gelded. Simple solution. Here are two pictures of him. All quotations and pictures are from the Web Page:of Mea Ola's Place. "Mea Ola, which means Survivor in Hawaiian, is a 14-year-old black and white Paint mare. She was one of the rescues from Kern County Animal Control. She was seized in November 2011, along with 5 other horses, for abuse and neglect. It puts a lump in my throat to think that I did almost leave her there. She was uncatchable and lame on both front feet and pregnant. I was scared and afraid she would be a giant heartbreak…but I took the risk anyway. I would hock my house for her now. I absolutely love this mare with all of my heart." "Mea Ola delivered a gorgeous filly on May 4, 2012. The filly’s name is Lokahi Malulani (Low ka hee, Ma lu lawnie). The first name means unity or harmony, the second means protected by God. Her barn name is Sassy." You can see Sassy as she looks now, by scrolling up this page to the video of her showing off for Spider, who also appears in the video as a very interested on-looker. You posted it before I did. But that's okay. It sure is an expensive deal those abusers and abandoners cost the good souls of the world who care about the animals they obviously do not. Here's a video of Spider today on his walk around the Place. Ann let him meet a couple of the other horses, and Spider did the same teeth clanking or clamping that Rowdy does. She calls it "yammering." Spider looked taller than Walker...yet Spider showed foal-like habits! Don't hurt me cause you look scary! LOL. Yeah. His demeanor made me think he was smaller than he is but Ann says he's 15.1 hands, as tall as Sassy and she's a big girl. Spider is still a yearling in spite of his size. He has 2 months before he's officially 2 and I don't know his actual birthday yet. I'm glad to hear and report that his knee is responding to treatment already. I passed along your comment about Rowdy and Spider taking over the house and she replied LOL". I remember her Vet was surprised when he found Rowdy "inside" the house when he first visited. And I remember Ann sleeping in the stall during the first few days...sleeping with Rowdy. I think the subtitle for that photo was "Sleeps with Horses"...a take off from Dances With Wolves. LOL!